Two years after the start of the conflict the arrival of the millionth refugee across the Syrian border is a stark illustration of a crisis that is bringing fear, pain and suffering on a massive scale. Within Syria itself violence is intensifying and more than 4 million people, at least half of whom are children, are in urgent need of humanitarian assistance. What was once a trickle has grown steadily until now more than 7,000 refugees cross Syria's borders each night. Travelling under cover of darkness, the refugee children and their families arrive at their destination frightened and exhausted, frequently with little more than the clothes on their backs. Many of the children have experienced tragic loss and witnessed horrific violence. Many are suffering with coughs, pneumonia and respiratory infections. Small children tell stories of how they hid in basements then found their homes destroyed and had to flee to the border on foot at night with the sound gunfire. We at LILY are currently trying to provide the children with a little comfort by giving each child their very own blanket made especially for them. Our blankets are lovingly made by adults and children from all walks of life and many different countries around the wold. They provide love, a sense of security, warmth and comfort to Syrian refugee children who have been made homeless by war and will send a message of concern and hope. Your participation is important in sending this message of hope, the thought that someone cares, that this beautiful, handmade blanket was created especially for them. It doesn't really matter what it looks like: even the most basic knitted blanket patterns will yield perfect results – a smile. 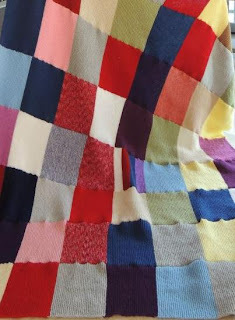 Please consider making a square or two, any spare wool you have can be knitted into eight inch squares and then we'll stitch them all together into a blanket.